The rebirth of Writing Outliner: Rewritten software and new website! Finally , the first beta test release of the rewritten WordOutliner is available for download! WordOutliner features, new 64bit Office support, new file-system-as-storage, much better performance and stability, and full Unicode support (means any character/string displaying problem for non-English languages should be gone)! 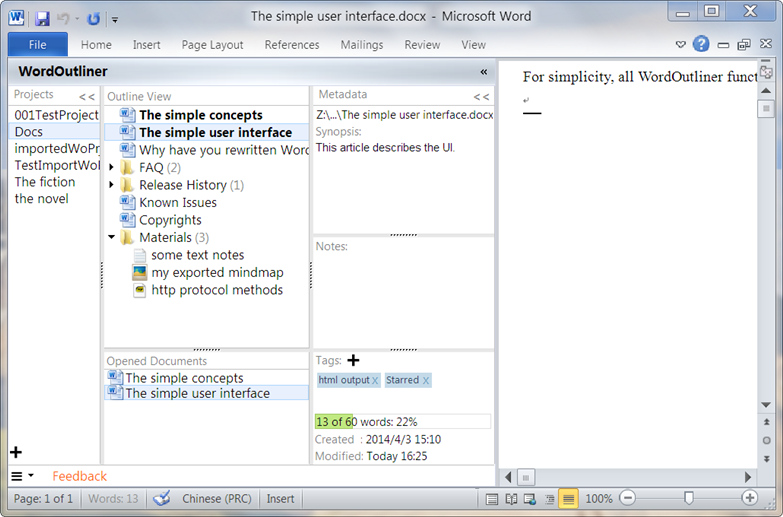 Head over to the new WordOutliner homepage (all news and updates will happen there from now on). Or visit the release notes blog post. It’s really quite a long time since the rewrite plan has announced. But you know, rewriting a software is not ease! Although a lot of features exist in the old Writing Outliner have NOT been implemented in the new WordOutliner yet , this beta 1 release can really be seen as a milestone of the development. You’ll see more frequent updates, as I’ll follow a ‘release early, release more’ paradigm. If you are an existing user of Writing Outliner, you’ll get a new license key for the first stable release of WordOutliner become available. Again: if don’t own a Writing Outliner license yet, buy Writing Outliner today and you ALSO get the new WordOutliner license when it’s out of beta.